SpeeCo - Post Hole Diggers - Tractor Mounted - Compact Post Hole Digger by SpeeCo Inc.
SpeeCo's new Compact Post Hole Digger was designed for the growing number of subcompact and CAT 0 tractor owners. It boasts many of the same features as the larger CAT 1 & 2 tractor mounted post hole diggers. 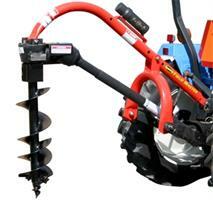 Ideal for drilling fence post holes, tree planting and other farm, home or ranch chores. Augers sold separately. No reviews were found for SpeeCo - Compact Post Hole Digger. Be the first to review!